Large Wedding Umbrella. Plenty of room to get two people underneath. Double ribs and stays for extra strength. 100% polyester fabric. 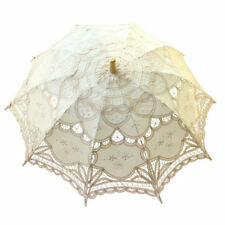 This Victorian Wedding Umbrella is feminine with subtle yet elegant undertones of a bygone age. 'The Victorians knew a thing or two about putting on a wedding with style and elegance. 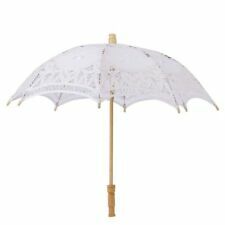 These exquisite and dainty Ivory Victorian Wedding Umbrellas are also available in white and black, pink, purple and all black. Ivory Wedding Umbrellas (7 Nr). Condition is New with tags. Dispatched with Royal Mail 2nd Class. This Ivory/cream coloured umbrella has a creative basswood wood carved rabbit animal head. Constructed with alloy ribs giving lightweight with flexibility and durability. Manual open and close. Unique and beautiful is the only way to describe these basswood carved animal handle umbrellas. Baby Pink Wedding Heart Shaped Umbrella - Used once by bridesmaid for a wedding and opened just for photographs, had no rain has a slight mark as shown and small pin prick hole as shown in photos, but only very slight and still in VGC. Scalloped Edges. Ideal for Weddings, Bridal Parties and Special Occasions. Matching Ivory Fabric Crook Handle and Co-ordinating Bow Detail. Ivory Fabric Crook Handle with Bow Detail. Span when open approx 83cm;. Length including handle 90cm;. 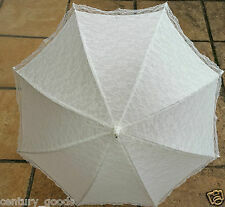 ELEGANT VICTORIAN STYLE PARASOL IN IVORY LACE. PERFECT TO HAVE ON HAND AT A WEDDING OR A TRIP TO THE RACES, THIS WILL PROVIDE SHELTER INCASE OF RAIN OR DAZZLING SUNSHINE! BEAUTIFUL FLUTED SHAPE WITH ELEGANT LACE EDGING AND CO-ORDINATING HANDLE.